Isn’t, as Baldrick believed, something made out of a lot of iron. Irony, as Alanis Morissette explained, is winning the lottery as an old man but dying the next day, being stuck in traffic when you’re already late or rain on your wedding day. She could add to that; Having a conversation with a work colleague about never having had a parking ticket, and then getting one three days after. There must be a higher being after all and he likes traffic wardens. And it was right outside my house !! 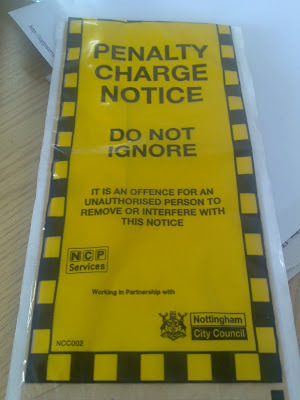 I’ve challenged it, I’ve got a pass but it had slipped down my dash-board, so I suppose technically I’m guilty, m’lud. By the time the very pleasant CEO had taken the photo of my car with the ticket sticking to the windscreen, the pass was clearly visible, so technically, he can whistle, m’lud. The £50 fine, trimmed to £25 if paid within two weeks almost tempted me to say ‘sod it’ and just pay it anyway, but I get the same two weeks to pay the £25 if I fail, so what have I got to lose ? Anyway, I’ve never won the jackpot on the lottery and I’d rather not wait until I’m 98, if that’s ok. Hopefully the higher being that likes lottery winners is listening this time. Do you remember Garry Parker ?